UPDATE: The video has been removed from YouTube as a result of legal proceedings surrounding the Center for Medical Progress and CMP’s lead investigator David Daleiden. More details can be found here. Several attendees made jokes about eyeballs and other fetal body parts “rolling down into their laps.” Others laughed as they discussed how hard it is to remove the unborn baby’s head from the womb. “I’m like — Oh my God! I get it! When the skull is broken, that’s really sharp! I get it! I understand why people are talking about getting that skull out, that calvarium,” joked Talcott Camp, who serves as deputy director of the ACLU’s Reproductive Health Freedom Project. Dr. Lisa Harris, the Medical Director of Planned Parenthood of Michigan, even admitted that abortionists view the unborn fetus as a person. 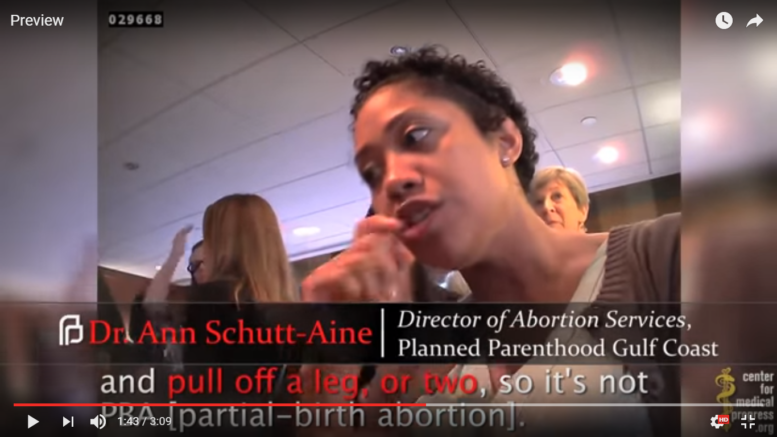 Another Planned Parenthood executive, Dr. Ann Schutt-Aine, discussed the abortions she performs in gruesome terms. “If I’m doing a procedure, and I’m seeing that I’m in fear that it’s about to come to the umbilicus [navel], I might ask for a second set of forceps to hold the body at the cervix and pull off a leg or two, so it’s not PBA [partial-birth abortion],” Schutt-Aine said. Several Planned Parenthood executives also referenced the sale of fetal tissue for profit, something that Planned Parenthood has vehemently denied participating in. “You know, sometimes she’ll tell me she wants brain, and we’ll, you know, leave the calvarium in till last, and then try to basically take it, or actually, you know, catch everything and keep it separate from the rest of the tissue so it doesn’t get lost,” explained Dr. Deborah Nucatola, the senior director of medical services for PP. Nucatola also appeared on several of the undercover videos that were released last year by the Center for Medical Progress. The Center for Medical Progress has been in the news since 2015, when they released their first video that allegedly showed Planned Parenthood executives and abortionists negotiating the sale of fetal body parts from abortions. Their videos sparked a Congressional investigation into Planned Parenthood and separate investigations by 12 states. In 2016, CMP founder David Daleiden and another member, Sandra Merritt were indicted by a grand jury in Texas. However, those charges were dismissed six months later.